Malaysians thronged KL city at 6 locations and slowly proceeded towards Dataran Merdeka for a peaceful sit down protest. 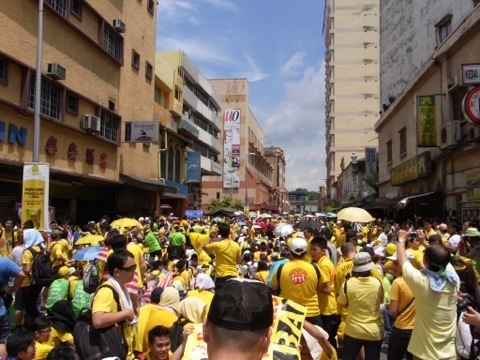 The police estimated 25,000 but Bersih estimated 250,000. Those who were there today believes there are at the very least well over 100,000 Malaysians who gave their voices and presence to call for a clean and fair election. The police shot tear gas and chemical laced water at protestors towards the end of the duduk bantah event claiming protestors broke through the barricades. The ugly and indiscriminate firing of tear gas gave Malaysian a bad taste believing that there was no reason to retaliate that way. The police actually moved into the city to clear the protestors even though they were already dispersed. Regardless of any trouble makers in crowds of such immense proportions, Malaysians have clearly sent a signal to our PM Najib very loud and very clear that they want a clean and fair election. It is evident that the PAC report did not go down well with Malaysians as it did not fix the problems but made it worse. Most demands were ignored or made it easier for fraud to happen. Will the Government listen and heed the demands to make the changes before the next General Election? The answer is a resounding NO and it doesn’t take an expert to tell Malaysians that Najib is going to ignore the ominous signs that Malaysians are fed up with his double talk and public show with no concrete actions. Today, Over 100,000 Malaysians show the Najib Administration and the world that they demand a clean and fair election but the forceful retaliation by the Police demonstrated the arrogance of the Government. Over 70 cities around the world also held similar sit down protests in support of Bersih 3.0 and the police provided polite and friendly security to them. What a contrast to the cruel Malaysian Police firing tear gas indiscriminately at the crowd. Bersih 3.0 is over. Those arrested are being helped by Suaram and the Bar Council. Those hurt are being treated. Hundreds of thousands of Malaysians are talking about their experience to stand in solidarity to send Najib a strong message and this cannot be any stronger. The writing is on the wall. Najib is in his last leg of state visits being in Sarawak this weekend. He will write off the Bersih 3.0 protest as an irritation and hope nobody will pay any attention to it after tonight. Hishamuddin has gotten his reply from the people regarding Bersih having no traction. The troublemakers who breached the barricades must be apprehended. The police who shot tear gas and water cannons indiscriminately and without warning must be held accountable. The KL Mayor and Hishamuddin who gave Bersih the run around and locked down Dataran Merdeka must take full responsibility of usurping the people’s right to the public place and realize they work for the people and not against them. And finally, our PM Najib who didn’t squeak a sound but triednin vain to tell the world he is liberalizing Malaysia with tear gas and water cannons cannot hide behind Hishamuddin and the KL Mayor. The stage is set. The people have come out to be counted and have given a message this time around in a very loud and very clear way, many times louder than last July. They return to their homes and await Najib’s response. Then they will know what to do at the coming General Election which is widely anticipated to be by end May or early June. The people will speak no more as they have spoken in such numbers never before in our history. What Najib does from now will determine what the people will do at the ballot boxes and the story be told if the election will ever be clean and fair. Heard that sumthng bad has happend sumwhere near sogo. N it was really sad to see the outcome of bersih 3.0 where it supposed to be a peaceful duduk bantah.. Cant wait to throw the vote. Ahaha.. Eh betul ke? Looks like there were rogue participants who thinks they are heros to fight the authorities physically. They cause harm to other innocent Malaysians and give the police the excuse to use the public paid tear gas on them. These fools must be apprehended but the police actions must also be held accountable. Seems they prevented reporters from recording police violence during the melee (reported in MalaysiaKini).